What the heck is Health Goth? While the term may look strange at first glance, the idea behind the wearing of head-to-toe black sportswear is simple: it promotes a way to make the fitness world more accessible to people who don't fit the stereotype of the typical gym-goer. Less about wearing any particular brand or even style of clothing, Health Goth is a a subcultural movement, a new point of entry for people who'd rather pump iron to Nine Inch Nails or Type O Negative than Maroon Five or Taylor Swift -- and who don't necessarily feel at home at the typical Top 40-blaring, Lululemon-dominated gym. The origin of Health Goth is generally traced back to April 2013, when two Portland men launched the original Health Goth Facebook page. Since then, others have taken up the Health Goth banner, including Chicago-based music producer and party promoter Johnny Love, the man behind HealthGoth.com. This summer, Love launched a line of t-shirts and sport bras that subvert -- with a sinister spin -- the look of fitness wear from corporate brands like Nike, Adidas and Under Armour. One of Love's designs, the "Dead Worldwide" shirt, is worn by nightlife personality Jazzeppi. Love hopes the trend will help encourage the dark-hearted among us to lead healthier lives. "The evolution, or rather, byproduct of its existence will be a generation of gym-goers who realize that you don't have to be a jock to lift weights, and who do it listening to darker and/or more aggressive music," Love told HuffPost via e-mail. The message appears to be resonating. What started as a social media meme now appears -- thanks in no small part to coverage from fashion and cultural publications including Marie Claire, PAPERMAG and Complex -- ready to hit the mainstream. The style has been described by some as an outgrowth from black-heavy looks like street goth or goth ninja, but there's much more to it than the clothes. As the cliché goes, it's seen by its devotees as a lifestyle. At its core, Love describes Health Goth as "about achieving an attractive level of physical fitness." In 2013, he created a "#HealthGoth Fitness Bible" that urged people to start eating more healthily -- refraining from eating anything that cannot be made in one's own home kitchen -- and to work out regularly, exercising one's entire body evenly by completing full exercises, not being afraid of lifting weights and, above all, "work[ing] out 'til you feel like death." Love doesn't particularly see anything too contradictory about bridging the ideas of "health" and "goth" together, either. Many icons of the culture -- like Trent Reznor and Glenn Danzig -- have remained in excellent physical shape throughout their careers. There's even websites like MetalWorkout.com, geared toward the fitness-minded who prefer music fast and frightening. "[Fashion designer] Rick Owens has sung the praises of working out and he has a good point," Love said. "Clothes fit and look best on a well maintained body, no one wants to see a Grover belly poking through your Under Armour compression shirt. After your body is right then you can swaddle it in all the semi-futuristic, minimal, monochrome sportswear you desire, and then it'll look good." 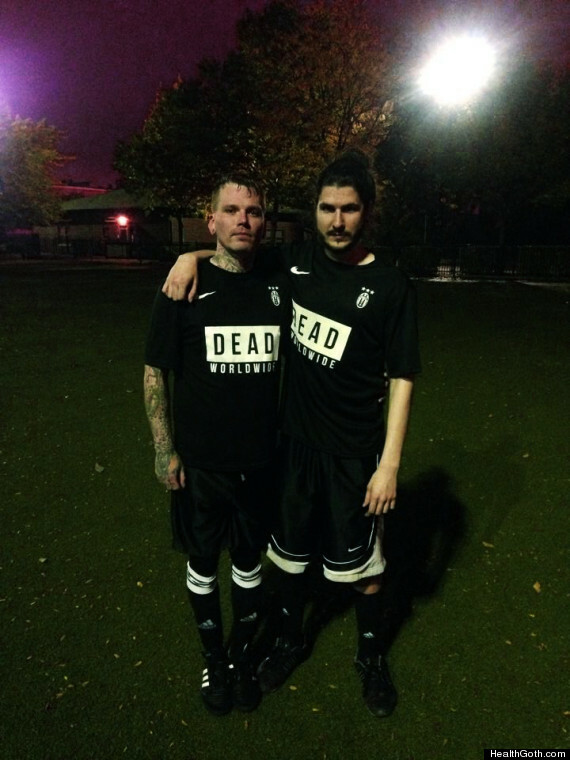 Love (right), with a friend, both wearing "Dead Worldwide" after a soccer match. Love has had success as the movement's poster boy. The first run of his line sold out, and he now has his eye on putting out a wider range of gear, including shorts, leggings, a football jersey and a low-cut bodybuilder-style tank top. But as Health Goth continues its evolution from a hashtag to well-known style and culture, could it be heading the way of preceding music-oriented microtrends -- like seapunk or "witch house" -- that lost their cachet when chart-topping pop stars co-opted the look? Love understands that exposure is "a double-edged sword," but is hopeful for a lasting impact regardless if Katy Perry or Lady Gaga pop up in music videos wearing monochrome black above Nike Roshe running shoes. "If only the superficial elements of Health Goth are what gains traction, then I see the same thing happening [to it]," he said, referring to discarded trends. "There are still people who dress 'punk' because there is an actual culture that goes along with it, [but] if something is solely a clothing style, then it can be tossed away and picked up by a mom on the sale rack at T.J.Maxx."